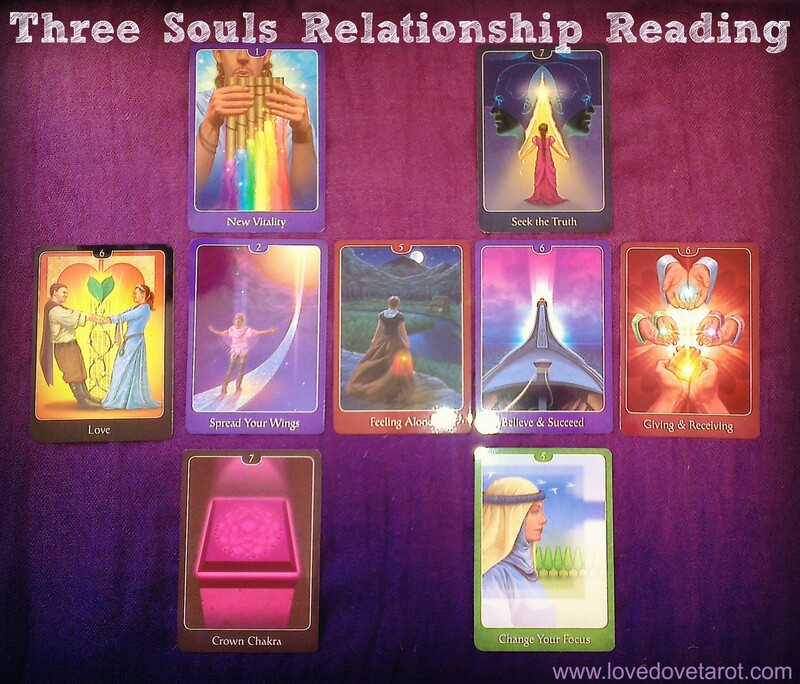 Last week, I posted a Three Souls Tarot Spread for personal development on www.tarotize.com. After creating this spread, it struck me that looking at the state of the connection of the Three Souls between two individuals could also be useful. I recently received a new deck, The Psychic Tarot for the Heart Oracle, and I thought it would work really well for this spread so I’m using it here but feel free to use a regular Tarot deck if you would like to give this spread a whirl. The Three Souls is a Feri Tradition concept to describe the three parts of the self, which roughly corresponds to the Freudian concept of the ego (talking self), id (fetch) and super-ego (god-self). However the Feri concept of the Three Souls takes into account that we are spiritual beings and that the Three Souls have energetic anchor points in the chakra system: fetch = second chakra; talking self = third eye; god self = soul chakra (6-8 inches above the crown). The Fetch is also known as the child/animal self and is the instinctual/sexual part of the self. Only the Fetch can communicate directly with the God Self and does so through a symbolic language – the language used in dream-time and mystical visions. The Talking Self is your personality and interface that you use to interact with the world around you, as well as to analyse what is happening internally. The God-Self is your divine essence and direct connection to Source/The Divine. You: Fetch – Crown Chakra. A knowing of the Fetch is indicated. There is resonance with the Higher Self. Him/Her: Fetch – Change Your Focus (5 of Cups/Emotions) A longing to know the Fetch can be seen here. There is dissonance and emotional dissatisfaction due to not heeding the Fetch or not connecting with the God-Self. You: Talking Self – Spread Your Wings (2 of Wands/Spirit) A longing for expansion and to prove oneself. Pride/Competitive spirit. Him/Her: Talking Self – Believe and Succeed (6 of Wands/Spirit) An innate sense of confidence. A decision to go after what one desires. You: God-Self – New Vitality (Ace of Wands/Spirit) An influx of spiritual energy is having a revitalising effect on the whole being. 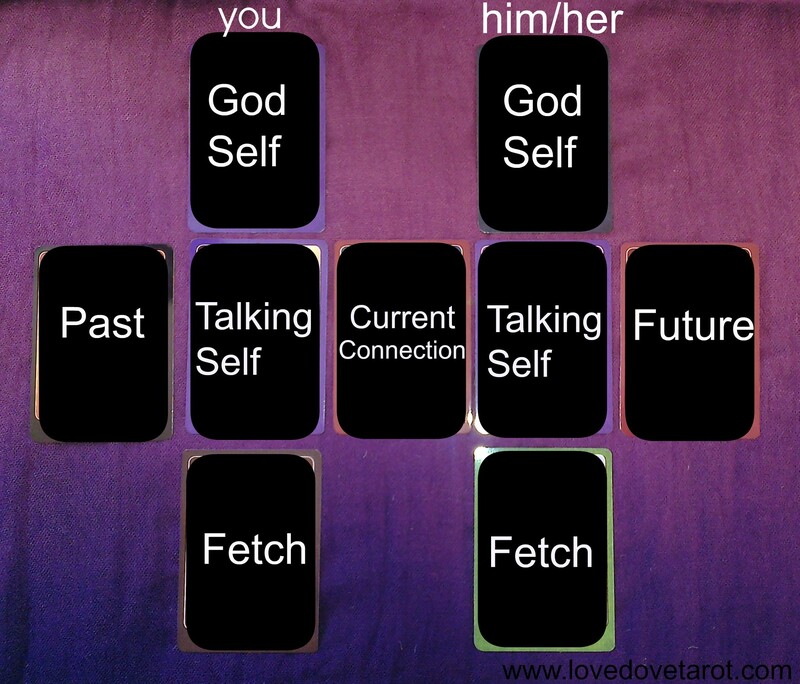 Him/Her: God-Self – Seek the Truth (7 of Swords/Intellect) Self-deception could be an issue. Time to face both light and shadow. Time to take off any masks and go within. Past: Love (trad. The Lovers) True love is indicated here. Current Connection: Feeling Alone (5 of Pentacles/Physical Realm) Physical distance keeps these two apart. Future: Giving and Receiving (6 of Pentacles/Physical Realm) A coming together – especially with three sixes in the spread.